The Teikoku Gekijo (帝国劇場, Imperial Theater) in Tokyo. 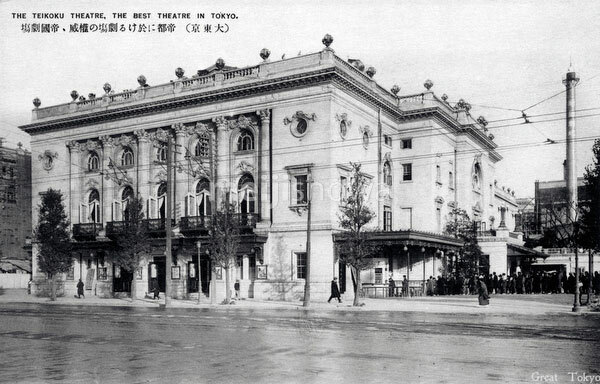 Also known as the Imperial Garden Theater, it was founded in 1910 (Meiji 43) and completed in 1911 (Meiji 44). The theater was Japan’s first Western-style theater staging the country’s first non-Japanese theater programs. It was designed by Tamisuke Yokogawa (横河民輔, 1864–1945) and located in the Marunouchi district across from the Imperial Palace. It was devastated by the Great Kanto Earthquake of 1923 (Taisho 12). After a complete rebuilding, it was reopened in 1924 (Taisho 13). The building was finally replaced in 1966 (Showa 41).